Just ME: Mama Elephant June Stampede! Absolutely adorable. I love love love this card! Aww--this is so sweet. Love the pjs. This is the sweetest card. The little boy is darling in his cute pj's. Love you you added the animals for him. 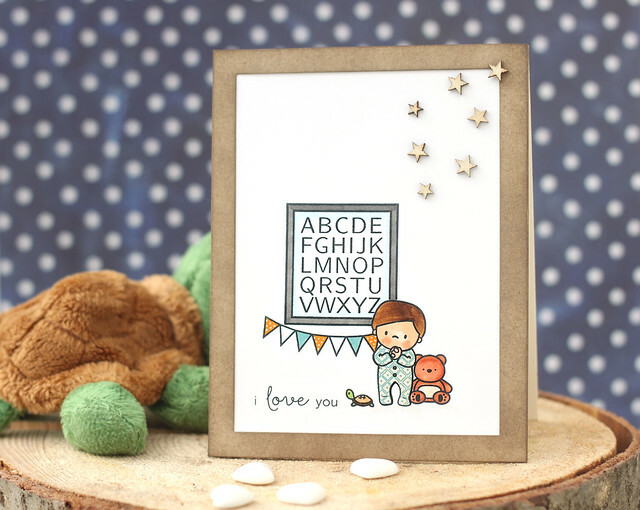 So cute the little boy with his bear and turtle, love this card!! Perfect paper piecing images. Adorable! Oh my gosh! This is CRAZY cute!! LOVE the pjs!! Just too adorable. So cute!! I already like ME on Facebook!!! What a cute card... I love the pajamas! tks for sharing. Such a cute card - adorable! You and your fellow DT's have made me so glad I ordered this stamp/die set early. It's sure to sell out. Your card is so darling...these images almost bring tears to your eyes. This is just so so cute, Elena!!! Love it! Love the pj's on the little kiddo and the wooden stars! 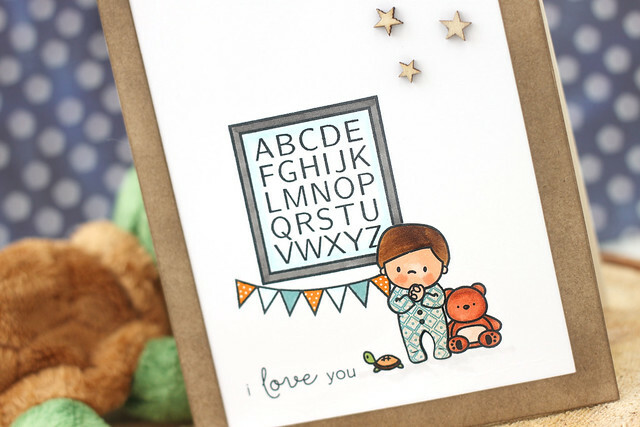 Your card is adorable and this June release has way too many "must haves" in it!! Love the nursery deco with the little boy in his cute pj! So sweet! Adorable card. Love how the wooden stars pop off the card. My favorite kind of pj's too. I miss the kids being little and toddling in them. This card is just adorable! Love everything about it. Such a cute card. I love the little boy in his PJ's. Love this card! It just makes me smile! such a cute card. love your idea for the new stamp set. Way too cute!! this card is a heart breaker cute!!! Great job! This is just too adorable! I love sleeper pjs for littles too! Super cuddly and a comforting scene you've made! I love the way you've added the little stars for an extra dimension--but it doesn't take away from the main imagery! Thanks! I am lovin' this stamp set!! How darling! Aw, such a sweet scene and the stars add the perfect touch! Adorable! First thing that came to mind when I saw this cute card was "Awww, how sweet." You did a beautiful job on it. What a lovely card! Just adorable! Thanks for sharing! Sooooo cute! I love everything about this card!!! Love the cluster of stars in the top corner. Just started following on twitter. So cure. Love the wooden stars. The alphabet sampler adds a realistic touch. The baby is colored so well. Great card. My fingers walk into the wrong paths sometimes. Super cute--love his paper pieced jammies! oh, boy, how cute is this?! the paper-pieced pjs make it! Sweet card! Love the paper pieced sleeper! So cute! What a cute card and stamp set! What a sweet image. Very cute card. What a precious card - I can see my sweet grandson in that image. So adorable and cute! What a super card! Super super sweet! I love it! Such a sweet card. Love the paper pieced pj's! How adorable is that little boy in his pj's? Soooo cute! Absolutely darling card, Elena! So glad to have your creations included on the hop! Oh, I love this darling card! Love those pjs.That stamp set is a must. Cute little fella in his footie jammies!! Love the paper piecing! Good job. How can you not love that sweet little boy? Adorable card! Perfect little images for a baby card, birthday of child, etc. Thanks to you, Elena, and Mama Elephant for sharing what we can do with the stamps! Oh, this is such a cute little card...love the little one in his jammies with the teddy next to him! Nice touch with the stars in the corner! So adorable. Love the star accent. Such a sweet little card! Love the stamps! How sweet...love how the little boy is clasping his hands and the use of wooden stars in the upper right. This card just melted my heart. Especially after seeing my granddaughter and nieces this afternoon. Cheers! This is a gorgeous card, and I LOVE the jammies!! This card is super sweet! Who wouldn't love receiving this card?!!! Your card is sooooo sweet. Love the tiny wooden stars. Such sweet images, love how you paper pieced the Pj's. What an absolutely sweet, sweet card! Love the design and the cute wooden stars you added. Beautiful bew stamps! What an adorable card!!! I use to dress my boys in those all the time too. Thanks for the chance to win! Awwww it's so cute! Beautiful coloring too! What a sweet card! Love those little star wood veneers on the top. Lovely card - so sweet! Love love love this card!!! So sweet. What a precious card! Love how you combined sets! Oh my gosh...what a sweet little card! Love it! that card is super sweet! Love it! I also like & follow ME on FB!!! Elena I love your card. love the new release from Mama Elephant..... and the card is so cute, thank you. Such a darling card! This is a wonderful release! This little boy was already adorable to start with but the paper-pieced pjs totally upped the cute factor!! The tiny turtle is so perfect too...LOVE your card!! I already follow ME on twitter! That little boy stamp makes me just want to give him whatever he wants to smile. Cuter than cute I love the pieced PJs also love these for toddlers too. I just want to give this little guy a hug and a kiss and tuck him in bed ! Such a sweet card, sooo adorable! This card is so darned cute. I love these little kids stamps. I love how you paired it with the nursery stamps! So darling! Elena! How utterly gorgeous! I am in love with this set and you just made it look even cooler with the patterned paper! I'm glad you combined it with the nursery set! Along the Hop I have been falling more and more in love with the little ones on the In My Heart stamp set. Want to hug them all. i love you card and am signing up to follow you. Thank you for the chances to win and it's wonderful card! Love how you used the veneer for the stars! Oh, this is so super sweet, Elena! What a sweet baby card -- it warms my heart! Such an adorable card...I love his footie jammies! What a cutie! Fabulous card! beautiful card, is so sweet! Such a sweet, sweet design. So precious .... makes me think of the Good Night, Moon book. Oh, Mama Elephant also liked on FB! This is so adorable! I love how you paired the two stamp sets, and the wood veneer stars add just the perfect touch. Beautiful! I love your use of both sets!! you're right, these images are so adorable. i love your card. Talk about gorgeous, I can imagine him saying 'i love you' in a cute little voice. Brilliant! Oh my gosh! This is just too cute!!! This just melts your heart! Little ones tend to do that...love your card! I. LOVE. this card! It's so sweet and simple. I love the added stars in the corner. Just perfect! Thanks for sharing! Darling card! Really sweet stamp set! Oh My, Elena...this card is just too adorable! great Job! Yes, I like on Facebook. What an adorable little boy card! What a sweet card for a little boy! Male cards are always challenging. Totally adorable! Those paper pieced jammies are so cute! He is just so adorable, I love that he is praying and love his little companions too! Love the cute design and the paper piecing on the pj's! Can't wait to get the new release items! I adore Mama Elephant products! Love the paper pieced pjs. Too cute. This is my favorite ME release yet! Bloomsies is simply the best and I can't wait to get it in my inky little hands!! Very sweet image for your card. Sweet card, would be perfect for my grandson!